What? A guided-inquiry, conceptual physical science course intended for teaching in a lecture-style environment, e.g. classes with large enrollment. Helps students develop a deep understanding of main ideas from physical science as well as the nature of science and the nature of learning. Unit 1: Interactions and Energy introduces students to all of the common themes of the course, in particular the themes of interactions between objects and the energy description of interactions. 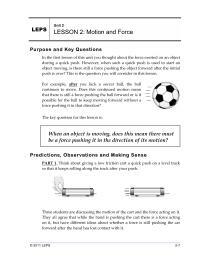 Unit 2: Interactions and Forces introduces students to an alternative framework (that of forces) within which they can explain interactions they first see in Unit 1 that involve objects pushing or pulling on one another. Unit 3: Interactions and Potential Energy introduces students to the ideas of "fields of influence" mediating interactions that can occur over a distance, specifically the magnetic, electric charge and gravitational interactions. The concept of potential energy is also introduced. Unit 4: Small Particle Theory of Gases introduces the scientists' Small Particle Theory (SPT) of matter and applies it to phenomena involving gases, making use of computer simulators that model the behavior of gases on both macroscopic and microscopic scales. Unit 5: Small Particle Theory of Liquids and Solids focuses on physical properties and changes in the context of liquids and solids. Students investigate physical changes at both the macroscopic and microscopic (small particle) scales. Unit 6: Interactions and Chemistry focuses on chemical changes and their particle-level underpinnings, employing both demonstrations (via video) and simulators that model chemical reactions and decomposition on both the macroscopic and microscopic scales. 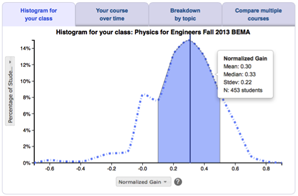 Intro Article: F. Goldberg, E. Price, S. Robinson, D. Boyd-Harlow, and M. McKean, Developing the learning physical science curriculum: Adapting a small enrollment, laboratory and discussion based physical science course for large enrollments, Phys. Rev. ST Phys. Educ. Res. 8 (1), 010121 (2012). You can order the LEPS materials from their publisher, Activate Learning. You can download a sample activity from PhysPort. F. Goldberg, E. Price, S. Robinson, D. Boyd-Harlow, and M. McKean, Developing the learning physical science curriculum: Adapting a small enrollment, laboratory and discussion based physical science course for large enrollments, Phys. Rev. ST Phys. Educ. Res. 8 (1), 010121 (2012). F. Goldberg, E. Price, D. Harlow, S. Robinson, R. Kruse, and M. McKean, Development and evaluation of large-enrollment, active-learning physical science curriculum, presented at the Physics Education Research Conference 2010, Portland, Oregon, 2010.